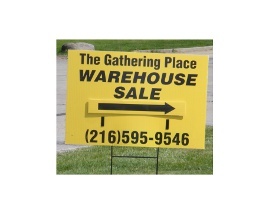 Fine furniture, china, home accessories, jewelry — you’ll find gently used treasures from some of the area’s most gracious homes at The Gathering Place Warehouse, 4911 Commerce Parkway in Warrensville Heights (map). This entry was posted in Shop Recycled, Take Action and tagged shop recycled, The Gathering Place Warehouse Sale, used furniture. Bookmark the permalink.